If it's A-F, though, then that means it would be a 3-3 arrangement instead. It should be changed to A-H. I am sorry, because I think I was still not capable of doing that. I am working on it, I will try my best, Thank you. =D I will. I seriously apologize for blunders on the previews chapter. Talk about fail. I hope everyone would enjoy this chapter, as much as I put all my heart to write it in order to redeem myself from my blunder. As usual if you find something wrong, please do not hesitate to tell me. Also as a notification, school is starting for me in a week, I might update a bit slower, but please bear with me. =) Have a nice day everyone! “We won’t be landing soon enough. Does anyone know how to do first aid; I doubt this is an ordinary flu.” Hayate, who came out of the Captain’s Room upon hearing Nanoha’s name said. “I can do it. Leave her to me.” Yuuno offered the help first before the blonde can even do anything. “Exactly, girl. While boarding the aircraft I let her sniff some dust poison from my collar without her noticing, ha!” The man said and continued to laugh to himself. As Miyuki started walking to the man to ask more info, a certain blonde had beaten her to it, going for the man’s collar. “I-I-It’s n-nothing too grave! It’s just flu! A-A-A bit of vomiting and t-t-t-then a slight hurt in the chest, I-I-It only lasts for 24 hours!” The man said as he panicked. “Yuuno-kun, leave Nanoha-chan to Fate-chan, come with me, I’ll assist in attending to the passengers, you too Miyuki-san.” Hayate said, as she winked at Fate, even though it isn’t the right time for her, to wink at her. “Its okay, Nanoha, you’ll be fine soon, we will get, Shamal-san to treat you. If the poison had a duration hours, I’m sure there would be a way to shorten it. Don’t talk anymore, just calm down.” Fate said as she got a weak nod as affirmation. “I will not leave her.” Fate assured Shamal as she held onto tighter to both of Nanoha’s hands. This is supposed to be, Fate and Shamal’s first meeting, and it had turned into this. “Good answer. Well I’ll be giving Nanoha-chan the shot now. Nanoha-chan, this could hurt for a bit, but please, bear it.” Shamal said as she got a bit of a nod from the weakening brunette. Shamal then got a small syringe from a tray beside her and softly injected some of its contents into Nanoha’s vein on her left arm. Nanoha gripped Fate’s hand tighter as she closed her eyes. The blonde then proceeded to caress the other female’s hair as she went through pain that only she could feel. “The direct application might cause for joints to hurt as if you are suddenly struck with influenza. A bearable but head breaking, head ache, and a bit of chest pains. After a few minutes, the treatment should’ve started to kick in, and she should feel better as the 30 minute mark for the medicine to fully utilize in her blood veins be seen. I’d like for her to stay for a bit more 3 days to a week so I could monitor her health, or if there are any risk of it coming back.” The short haired blonde said and gave Fate a nod as Nanoha’s struggling started to lessen. Fate diligently wiped each of Nanoha’s sweat that trickles down from her temple, as they all waited, including Hayate, Yuuno and Miyuki, for the medicine to fully cure Nanoha, before talking about this incident. As if it was eternal, 30 minutes had passed, and Nanoha was sleeping peacefully on a hospital bed in Mid-Childa, with Fate not letting go of her hand, and the others sleeping at the benches outside of the said room that has “301” written on it. “Uhn...” The copper browned female uttered as her eyes fluttered due to being distracted by the sun. “Fate... Fate-chan...?” she said as looked at her hand being carefully held on to by Fate who fell asleep beside her. “Please bring some food for Fate-chan too. I’m sure she’ll be hungry too when she wakes up.” She whispered to the other female and winked. As the other person smiled at her and nodded. “Fate-chan...” Nanoha said as she tried to reach for the sleeping blonde’s face, Hayate and Miyuki barged in on the door with their crying faces on. “Hayate-chan! Onee-chan!” Quickly withdrawing her free hand for the sudden touch. “Nanoha-chan! I was so worried! Are you okay now? Does anywhere hurt?” Hayate panicked as she was ‘sshh-ed’ by Nanoha, since the blonde beside her was still sleeping. “Oops, sorry. Yeah, she was awake the whole evening looking after you. Why don’t you give her some sort of reward?” The short haired brunette whispered, and winked. “Ah, that’ll be great. Well, Nanoha-chan, we’re just going to get some food in the cafeteria. Get well soon~ Onee-chan is worried.” Miyuki said and smiled. The two went out of the room, with Yuuno bumping onto them as they walked out. “Oh, she’s fine. Still resting, let’s eat first, Yuuno-kun.” Hayate said and smiled at him. At the same time inside the said room 301, red eyes scanned the room after seeing hands connected. In shock she bolted right up from her sitting position, and accidentally hit her head on the dextrose pole behind her. “Ow.” Fate said as she heard a light chuckle from the person her hand was connected to. “Fate-chan, relax.” Nanoha said and caressed the blonde’s head as red eyes rapidly blinked trying to shrug off the pain. “Thanks, Fate-chan. What is it?” The blue-eyed female asked and looked at the red eyes of that other person she’s talking to. Although, Fate seems to have noticed it and took back what she said. “I... um... I’m asking such a weird thing. Hahaha! Sorry, even if what you needed was rest. Looks like I’m stressing you out more... I’m sorry; I’ll just go to the comfort room.” The blonde said and excused herself. As she walked away from the room she saw Hayate, Miyuki and Yuuno turning into the corner where she was. “Hayate-chan... do you notice the tension? From Nanoha-chan and Fate-chan.” Miyuki said as she whispered to Hayate’s ears. “Well... it’s there, let’s bear with it for a while? I can ask Fate-chan later.” Hayate said them as Shamal entered the room with a test tube on her hands. Even though the tension in the air is present. Everyone was still listening carefully even though hands fiddling with bed sheets or inconsistent eye focus are seen from the two. “Exactly.” Shamal answered as she looked at Nanoha. “So you’re basically telling me... the robbery attack was planned by Regius Gaiz’s to attack and sabotage UIA, is that it?” Nanoha said as Shamal gave her a nod. “That is what I am trying to say but what’s wrong about this speculation is...” Carim said as she looked at her companions. “We don’t have evidence.” Fate said as everyone looked at each other. As you said in the A/N, you raise some questions. I have the impression Nanoha have meet Fate long before their first encounter and is the cause of Nanoha's break-up with Yuuno. I also wonder what'll be Regius next actions. Overall, nice and sweet chapter. 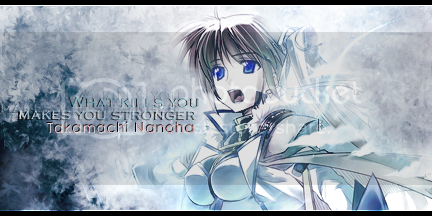 Maybe Nanoha cried coz Fate doesn't remember her. Thanks for the update, this was a fun chapter, I thought that Nanoha was sick, but I'm glad that I was wrong. Great update Kona! 'Twas an excelent read you know that. But yeah, so far I'm votin' that Nanoha remembers Fate from a past life and Fate doesn't remember Nanoha, but anyways I thought it was a very well written out chapter and I can't wait for yer next update. Keep up the great work my friend and until than, here is some writting gear. *gives Kona a combat helemt, army fatigues, and combat boots* Now, go get those words soldier! And now, here is a random video clip, Wolverines! A/N: Nyaha~ I’m very very glad that everyone liked the previous chapter. Was I able to redeem myself? XD! She then shuffled into the papers and looked into her medical records. Staring at it and giving it quite an interesting smile. “Is that so...?” She said in an interested and questioning tone, and then sipped on her milk tea. “We have to get back to Earth as soon as possible.” Carim said as everyone continued their discussion in Nanoha’s room. “But, I’m sure they already know Nanoha-chan what if they attacked again thinking that she’s not yet cured? We’re putting all the passengers in danger Carim.” Hayate answered as she sipped a bit of water from the glass she had brought inside from the cafeteria. “Then we’re leaving Nanoha-san and Fate-san here.” The blue eyed blonde answered getting into an argument with Hayate. “We can’t do that! They can’t attack Mid-Childa’s Airport!” Hayate answered a bit agitated as Fate tried to break them. “In what statistics do you think would that work, Fate?” Yuuno finally getting some screen time said. “Fate-chan, but aren’t you forgetting that you’ve caused quite a ruckus last time too?” Shamal said as to she was fully informed of all the events in the aircraft, leaked out by Miyuki. “I’m going to stay in the front flight attendant as Hayate’s partner, doing the talk duties so I wouldn’t have to fully show my appearance and can only help in preparing the trolleys and talk.” The red-eyed blonde answered with a serious expression looking at Nanoha. “Nanoha, please help me.” Who received a nod in return. Hayate and Carim, fully thinking out the benefits of the operation agreed and talked to the airport staff in charge on the booking of the flight to let Nanoha on the spot buy and book the flight and do the mission. “We…Welcome to flight 5X-327 from Mid-childa. Destination is from Mid-childa International Airport to Uminari International Airport. Departure time is 6:45am and estimated time of arrival would be 4:45pm of the same day with Uminari’s time being behind by four hours. Your flight would be led today by Captain Carim Gracia with co-pilot Shamal.” Fate said as a sweat trickled from her forehead, despite being in an air-conditioned flight. As Fate finished speaking through the intercom, Nanoha whistled to catch her attention. Fate looked at her with a confused expression and asked a silent ‘Why?’ with Nanoha replying her with a ‘Not bad,’ and a wink. The blonde immediately blushed and bowed her head to hide it. “Nanohaaaa… please, stop teasing me.” At the same time Hayate returns to her seat to buckle up as the aircraft is taking off any minutes. “Cabin crew prepare for take-off.” Carim said as her voice was heard in the entire aircraft with the flight attendants taking their seats from the front and back side of the plane. Everything went smoothly as they made their trip to Japan. Fate occasionally walks toward Nanoha to ask her if she’s fine, Yuuno also does the same only to be shrugged away by the copper brown haired female. “Nanoha’s only been looking out the window, even if she sees nothing but the clouds… and the sun, she won’t sleep?” I asked Hayate who’s sitting beside me looking around at the passengers. Nanoha really does look tired… ah her head dropped, she hit it on the window cover… she shrugged it off. She put her elbow on the arm rest, reclined the seat a bit, and then rest her head on her palm. Ah, her head fell again. She must’ve been really tired, but she’s still doing her job, looking out for everyone. She looked at me and caught me looking at her. I immediately blushed as she flashed me a smile. ‘Isn’t it in situations like this, the person who turned to look should blush…? Maybe not.’ I walked up to her and smiled. “Do you need anything?” I asked her. She then looked at me and smiled again. I watched only her for the last few hours of the flight and I actually had fun since we were silently talking from a far. I wonder if we understood each other fully… maybe. There’s something with her that makes me feel complete, although I don’t know what it is. After all passengers had gotten off from the plane, the crew went back to the main office with Nanoha and Shamal going straight to the clinic, and the rest giving a report to Lindy Harlaown. “Good answer. Carim-chan, Hayate-chan, come into my office for full reports and planning, and Fate-chan, come to my office after you’ve seen Nanoha-chan, okay?” Lindy said as the two followed them, whereas Yuuno went back to his post and Fate gave her a stern nod and walked towards the clinic. “Fate-chan, I didn’t say that at all, Nanoha-chan is just a workaholic, that she says she’s fine so she’s going back to work, ‘nyahaha’” Shamal said as she perfectly quoted Nanoha’s signature laugh at the end of her sentence that made Fate chuckle. “Lindy-san just gave me a 3 day day-off to take care of my ‘senior’ so I guess it goes for you too, Nanoha.” Fate said and smiled. “Takamachi Nanoha, please proceed to Lindy Harlaown’s main office after your check up.” The base intercom called on to her as they all agreed to let Nanoha go while Shamal talked to Fate more. “What happened to Nanoha?” Fate asked as Shamal walked around her office and sat on her table. “Ah, Nanoha-chan, you’re finally here.” Lindy said as she took a sip of her milk tea. “Can you… get the File #010 Incident Report on the bookshelf inside that room?” She said as she pointed to a room, inside her office, she opened it and revealed a smaller room that has around 3 book small book shelves. “Eh? O-Okay.” Nanoha, although puzzled, agreed anyway. At the moment Nanoha went inside the room, the door to Lindy’s Office once again creaked open. Inside the small library, Nanoha, leaned her back onto the door and was shocked to find Fate inside the office, even if she was still inside. Panicking on what she should do, she stayed behind the door, half-eavesdropping into the conversation. “You don’t have any intentions to get them back?” Lindy asked as she waited for Fate’s response. “It’s because, I haven’t found any person connected to my past yet, who might’ve known me from way before, who can remind me, and tell me what happened.” Fate said and smiled. “When did this start?” Lindy asked sipping on her tea. “Oh, That’s pretty much everything in your Bio data, grew up in Uminari City Orphanage since you were 9 years old until you were 16, studied in Seishou Middle School/High School, and a Criminology Graduate with Honors.” Lindy said as she re-arranged Fate’s bio data. “Yes Ma’am, that is about it.” Fate said as she played with her skirt’s hem. “What would you do… if I told you that I know someone who might’ve known you from the past?” Lindy said as she saw Fate’s shocked reaction. “I’d like to know them, and of course ask about myself… but I just can’t do that out in the open, but if given the opportunity, I’d definitely want to… know more about myself.” Fate answered and smiled. “What was that all about?” Fate wondered as she walked towards her office table to clean a few stuff and arrange her desk. Meanwhile Nanoha entered from the front door as to she had escaped from Lindy’s hidden backdoor. “Ah, Fate-chan, you’re little baby of a senior is here to fetch you.” Hayate said as she almost bumped into Nanoha entering the room. “Hold on, I’ll just finish a few of these.” The blonde said and quickly shuffled through her desk. The whole base echoed as a horde of men wearing kabuki masks appeared. *eyes glitter* YOU HAVE TO WRITE MOAR! MOAR I TELLS YA! Ah, hello Sigurd-san, please don't die~ I will definitely update soon. =D And I'm glad you like where this is going. XD! Nice chapter, which adds another mistery to the plot. So Fate is partially amnesiac, and it's linked with both Nanoha and the Jewel Seed Incident. I'm curious to see what Nanoha will do. It seems like Nanoha and Fate effectively met before, with you brining up the Jewel Seeds I bet it was something like in the original series.